Size: 9.3" x 8.3" x 2.0"
The same housing was used two years later again with the TI-5045. Dismantling this TI-5130 manufactured in 1983 reveals a completely revised printed circuit board (PCB) centered around a NEC uPD1234G single-chip calculator circuit versus the Mitsubishi M58680P chip of the original design. 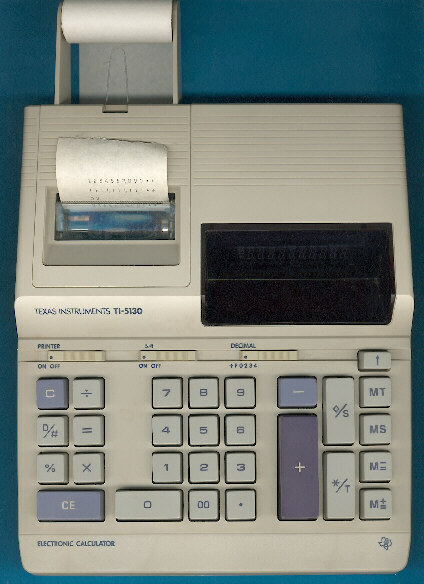 The design of the TI-5130 was changed in 1985 again to a "brown" design scheme, matching the TI-5140 introduced in the same year. Texas Instruments introduced already in 1986 with the TI-5130 II the successor of the TI-5130 with a completely different design language. © Joerg Woerner, February 17, 2003. No reprints without written permission.